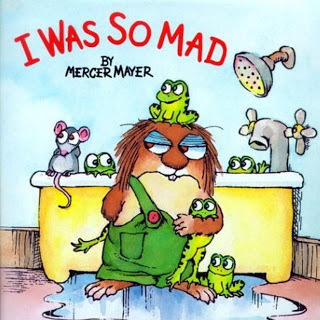 When I was a kid one of my favorite books was "I Was So Mad" by Mercer Mayer. The premise is that Little Critter wants to do different things and his parents or grandparents won't let him. So he replies with some variation of "I was so mad." It was also a book that my cousin tape recorded for me. (Best gift idea ever for young kids. Audio record yourself reading a book, ringing a bell to signal turning the page.) So it was obviously something I read over and over and over. When your little, emotions are limited. You're happy. You're sad. You're mad. You don't have the language or understanding to articulate that you are disappointed, or frustrated, or hopeful, or joyful. The variations of emotions aren't there. This book came to mind last week as "I was so mad" at my best friend. She shared some news with me and I couldn't even look at her for a good 20 minutes. Then throughout dinner I was careful to stay with the superficial. The safe. If you read this blog at all you know that something I struggle with is communication, and being honest with other people. Even when it means putting myself first for a moment. At one point in our conversation I stopped and told her I needed to explain. Driving home I was fuming. But the next day I realized it wasn't anger I was feeling. It was massive disappointment. I wasn't so mad. I was so disappointed. For me, learning that difference, seeing it, and recognizing it... was so important. It was a lesson that I needed to learn. I often say that something makes me so mad... but I now realize I need to recognize what the real emotion is. Under the surface. I love "aha" moments like these; even if it means at times that a better understanding of my emotions may lead to a deeper pain, I'd rather not the not-knowing add to the whole mix. I'm glad you were able to analyze your feelings better--one step closer to reconciling them.